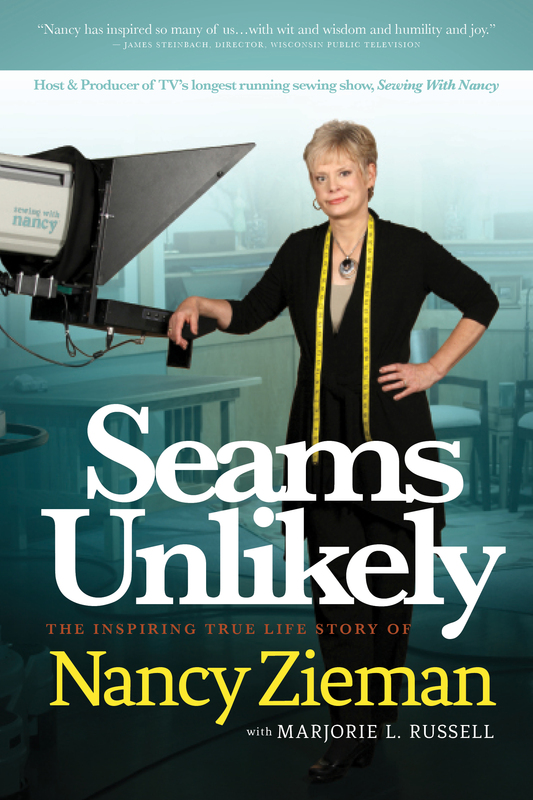 When I was asked to be a part of Nancy Zieman’s “Seems Unlikely” book tour, I immediately said yes. I’m a fairly new member to the Nancy Zieman Fanclub. My mother is a garment sewer, but I have always taken more to quilting. I made several garments including dresses for school dances, an 80’s shorts-and-top set in unfortunate matching fluorescent patterns, but the garment sewing classes I took back in 1996-97 were in Europe. So I missed out being introduced to Nancy and her expertise. Though I’m new to the club, I’m not a token member. Nancy truly won my everlasting sewing love with her Create a Strap (I did a review that is best defined as a “love note” over at Craft Test Dummies). I’ve had a chance to play with her laser cut fusible appliques as well as her trace and create tablet keeper. I was able to “meet” her during a closed-circut session at Riley Blake Fabric Fest this last fall. Each one of these times I’ve had the chance to connect with her through product or experience, I’ve walked away an even larger fan. So, enter the chance to read Nancy Zieman’s Biography, and I was all in. At about 300 pages, it is told as if you’re sitting down to coffee with Nancy. As if she’s telling you the story of where she was born, how Bell’s Palsy and multiple knee surgeries affected her confidence, and how 4H played a significant role in finding her joy. As I’ve been reading Nancy’s book, I have found myself relating to so many of the stories. I didn’t grow up on a farm or have a smile that was higher on one side. But those are characteristics of Nancy’s life – not elements of her character. While writing this post, I’ve put a bandaid on one child’s elbow, fixed a Lego car, and had a 20-month-old crawl over me, needing some extra snuggles. Trying to manage a career from home while raising boys and managing a household isn’t easy. But as Nancy showed, it isn’t impossible. Through the support of her husband, and the help of family, she turned her single-page flier into a booming catalog (and now online) business. Her traditional farm upbringing gave her a work ethic that helped her plow forward through adversity. Today, women-owned businesses aren’t rare. And gals like me working out of our homes at laptops while children play not-so-quietly may not be “normal”, but it isn’t the struggle it was when Nancy began. I’m loving reading this book. I’m inspired by Nancy’s journey. She didn’t let small spaces or small minds keep her from being successful. I wish I could tell you that I’ve read it cover-to cover already, but other commitments have kept me from getting much further than halfway. But I’m really looking forward to the second half. If you don’t already have this book on your nightstand, make sure you pick up a copy. The first half alone is enough to get you writing lists of your dreams, re-naming them goals, and start making them happen. Thanks, Nancy, for sending me your book. I’m truly loving it. I’m sure you have many more years of amazing adventures in front of you… I’m already wondering when you’ll be publishing the next installment. What I’ve heard and read about Nancy hits close to my heart. I have followed her on PBS when I could. I’ve always admired her creativity. She is a victor not a victim. I would count it a privilege to own her book and share it with my daughters and sisters. Thank you for making that possible for someone.. Many thanks for featuring Nancy Zieman and her book. I have been a fan of Nancy’s for a good number of years, watching her PBS series on a regular basis. I learned many, many sewing skills, tips and tricks from her. I am so delighted her book is now available and certainly encourage all of your bloggers to purchase a copy of it to read.